This painting (like the similar Still life with a chair, shirt and towel [q.v.]) seems to illustrate one aspect of the two very diverse styles which informed Verdoodt’s work. It appears, at first glance, to epitomize the realistic: perfectly rendered, accurate images of very mundane articles. The chairs in both paintings recall Van Gogh’s painting of the yellow chair in his bedroom, whilst the collection of objects on the chair seats are reminiscent of 17th century Spanish still life paintings. 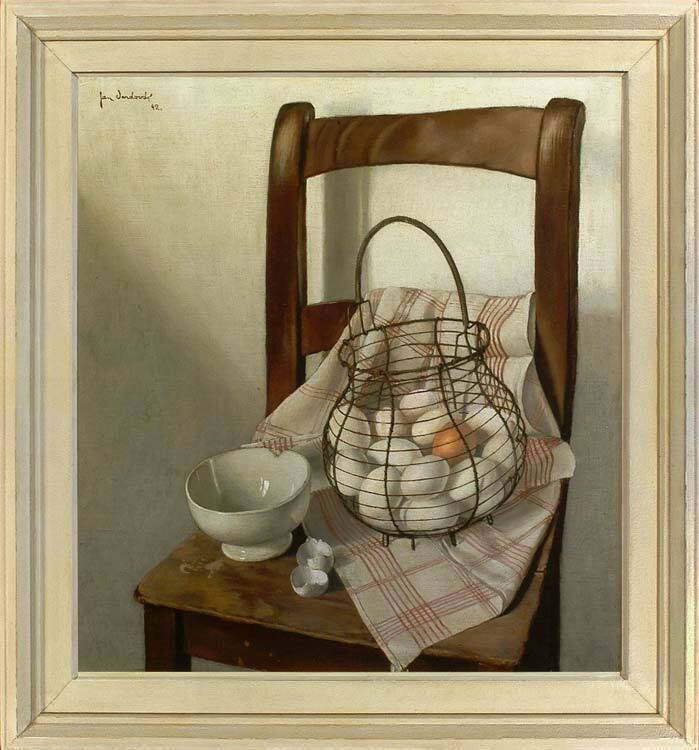 However, the tilted viewpoint, with its slightly strange perspective, and the hyper-realistic treatment of the tea-cloth and eggs, are at the same time very clearly the work of the Surrealist Verdoodt, who produced Dali-like arrangements of objects in outdoor settings and other-worldly landscapes. These are still life paintings with an intellectual and symbolic sub-text, which will grow richer with continued study. Jan Verdoodt (1908-80) came from Sint-Pieters-Jette in Belgium. He attended the Academie van Sint-Jans-Molenbeek from 1926, under Frans Persoons, where he was attracted equally by Realism (in the work of E. Laermans) and Surrealism (in Magritte’s paintings). He developed his own style by combining these two schools, creating ‘a kind of magic realism in which dream and reality, woman and nature, were intimately bound together’. He began work as an apprentice in a lithographic studio and worked his way up to become a photo-engraver. He produced portraits, self-portraits, still life paintings and a few landscapes, and was a founding member of the Cercle Jecta in 1938 (Magritte was also a member). His work has been acquired by the Belgian state and by the province of Brabant, and he has given his name to a road in Jette and to a path in the Parc Baudouin. See the webpage for Jan Verdoodt at: http://www.avdmv.com/general/pagartist/Jan_Verdoodt.htm .